In this section you will find some useful information on Porcelain tiles. 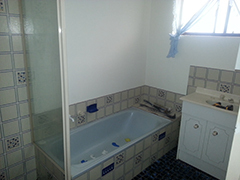 Flawless Tiling gives you the best possible prices on Porcelain tiles and porcelain tile laying services. Flawless tiling offers a range of per-sealed porcelain tiles. We sell tiles by them self or as a total package. Porcelain tiles by Flawless Tiling are below retail price and a high quality product guarantied for 10 years. Porcelain tiles have become extremely popular in recent times, for their durability, low maintenance and lavish looks. Porcelain tiles are very hard wearing and used quite often in commercial applications such as shopping center malls and shops. Porcelain ties can be used indoor and external, in bathrooms and most commonly in main living area floors. Porcelain tiles have a square edge rather than a rounded off or cushion edge in ceramic tiles. The edges of porcelain tiles are machine cut in the factory making them a more precise tile and calling them a ratified edge tile which gives it the square defined edge. Because of the rectified edge laying porcelain tiles becomes more difficult to get a flat finish without noticeable lips. This is where skill and patients that will fall into the hands of the tiler Some tilers are now using lash clips for rectified edge tiles but what must be understood is that lash clips do not and cannot fix up uneven floor surfaces. Porcelain tiles are either pre sealed from the factory or non sealed. Pre sealed porcelain tiles are by far the best saving for money and time during the laying process. Non sealed porcelain tiles need to be cleaned polished and sealed after laying has finished. Non sealed porcelain tiles may cost between $8 to $25 per M2 to be sealed. At current Flawless Tiling does not do porcelain or stone tile sealing ,there are companies around that specialize in the cleaning polishing and sealing of porcelain tiles and stone tiles. SPEACIALIST IN LARGE PORCELAIN TILES !